"All they sacrificed for me, poured out like water on the ground. All I might have given for love's sake. Too late. Dyin', slow as a tree. The closer you are to Caesar, the greater the fear." MPAA Rating: R for realistic war violence and language. There has been much discussion at the office about The Thin Red Line, where my colleague has led the troops against Terrence Malick's art house war film. "He cuts to a shot of a leaf, and you think to yourself, enough with the leaves!" Now I missed this in the theaters, simply because after Saving Private Ryan one near 3-hour war movie was enough, but I've eagerly awaited the DVD release nonetheless. Sorry Carol, but I was stunned. Malick has brought to the screen the spiritual film that WWII has been missing. 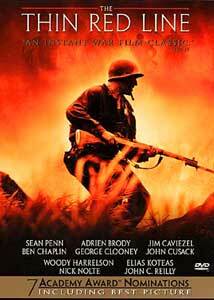 The Thin Red Line does for WWII what Platoon did for the Viet Nam war. While the sheer power and grandeur of WWII is highlighted in Saving Private Ryan, this is a more personal film that brings out the inner world. It is the sum of the parts that make this vision whole. In a war of such magnitude, as similar to the case in Hamburger Hill, this is a just one battle for one Melanesian hill, on one island, in the middle of nowhere. "They call it 'The Rock.' Now nobody wants this island. The Japs just put an airfield there. All the fighting is confined to this area [one section of the island]. As you can see this is their roadmap to Australia and their way of controlling the sea-lanes to America. If we're going to stop the Japs advance in the South Pacific, we gotta do it there. The Marines have done their job, now it's our turn," Quintard (John Travolta) tells Tall (Nick Nolte). This is a war of small, yet enormous dimensions. A war of inches, a war for property, a war of thoughts, a war for a way of life. But why? The Thin Red Line asks the basic universal question: Is the thing that drives man to war innate? Passed from one generation to the next like a family heirloom? "This great evil. Where does it come from? How did it steal into the world? What seed, what root did it grow from? Who's doin' this? Who's killin' us? Robbin' us of life and light. Mockin' us with the sight of what we might have known. Does our ruin benefit the Earth? Does it help the grass to grow or the sun to shine? Is this darkness in you too? Have you passed through this night?" asks Train. From the outset there are many wars being waged: the outer war, the inner war, the war between man and nature, man and man. War is not just a battle with the enemy, but often within ranks and within us. Nick Nolte brilliantly portrays a man caught in the middle of these battles, Colonel Tall, the disgruntled lifer, who having been passed up for 15 years finally sees his first action, and perhaps his only chance to earn the promotion and respect that has eluded him until now. "There's always someone watching you," Quintard tells Tall. In his way is Staros, played superbly by Elias Koteas, a man less willing than Tall to let his vanity risk the countless lives of the young men in Charlie Company. But Tall is not unaware. It is fear that drives him. Malick's directorial craftsmanship throughout is both visually and emotionally stunning. For instance, the moments leading to the first battle for the hill. His technique in this scene is one of the truest to form uses of the Hitchcockian theory of suspense, whereby the director builds anticipation by showing the audience but not the characters the bomb under the table. In this case, we see the bunkered machine gun turret on the ridge of the hill, beginning a not so subtle dance that taps into your head until it nearly explodes and then it does, into a full fledge battle. His inter-cutting between the reality of the war around these men, their inner thoughts, and the beautiful, exotic and tribal world drives home the ugliness and the ludicrous nature of war. War is a game ordered by old men, but played out with the lives of the young. But where Tom Hanks in Saving Private Ryan is the Everyman, every man in the Thin Red Line has his own voice, his own fears, his own way of addressing the unknown. Some are restless, some are at peace, some lose it, and some can overcome their fear, while others fall prey to it. This is where Terrence Malick's artistry unfolds like a child's paper toy; a flap opens here, a flap opens there, and all together the flaps create a message from the sum of the different pieces. War and life are not one dimensional, they occur on many levels. It is the inner voices we hear that play such an interesting role in this film. Every character has his thoughts, which search for answers in the world around him, or betray the air of confidence to the point you can nearly smell their fear. Every muscle tenses with the anticipation of battle, every bead of sweat tingles the skin, while the stress brings memories floating across the sky of our mind as we phase out of the real world. In Malick's screenplay of the James Jones novel, the past, present, and future meet in a dance of the eternal. Some of the discussion of this film centers on the use of notable Hollywood actors disrupting the films continuity and one's suspension of disbelief. I would argue that with the exception of Woody Harrelson, the cameo appearances by John Travolta, John Cusack, John Savage, and George Clooney flow by without much fanfare. There are no main characters here, really. The point is that every man blends together, becoming one, so that you can't tell one from the next. Also, that there is always another man waiting in line to take the last one's place. They are interchangeable—as in real war. I don't think it is a coincidence that you can barely tell the difference between the narration of Train (John Dee Smith), Welsh (Sean Penn), Witt (James Caviezel), and Bell (Ben Chaplin). Really, the only way to associate the voice-overs to their character is to turn on the captions. You might find it as interesting as I do that the pathetic, whiny, country bumpkin—Train—is the most elegant and poetic narrator throughout. The one you think the least of...Isn't it always the case that the monologue that goes on in one's head is more poetic than what come out in public. "I remember my mother when she was dying, looked all shrunk up and gray. I asked her if she was afraid. She just shook her head. I was afraid to touch the death I seen in her. I couldn't find nothin' beautiful or uplifting about her going up to God. I heard people talk about immortality but I ain't seen it. I wondered how it'd be when I died, what it'd be like to know that this breath now was the last one you was ever gonna draw. I just hope I can meet it the same way she did, with the same...calm. 'Cause that' where it's hidden—the immortality I hadn't seen." Image Transfer Review: Fox's delivers its first anamorphic release since the Alien Legacy set in its original 2.35:1 theatrical widescreen aspect ratio. This transfer is a beauty, which shows exactly what Fox is capable of when they put their mind to it. The colors are deep and rich, with little bleeding. The grassy fields are vivid and alive, and this is the image on a TV that doesn't show the 33% increase in resolution. Contrast is generally very high, even during most night sequences, helping keep a clean, sharp look throughout. Fleshtones are normal, and the black levels are very good. There are minimum levels of both scratches and aliasing, and only one case of pixelation that I noticed (ch22, 2h:08m:30s). While Fox should be applauded, this is only a baby step, and, honestly, to take this step and not many others would be a tease not well received by Joe Average DVD Forum member whose favorite movie is released non-anamorphically after seeing this beauty. There are reports that Fox's stance on anamorphic transfers is changing. To which we say: Hooray! Audio Transfer Review: There are two soundtrack entries. The first is a solid Dolby Surround 2.0 track, which holds some of the overall sound value, but falls short with the lack of discrete bass and surround effects. The Dolby Digital 5.1 on the other hand is deep and rich with bass, from the low hum of the patrol boat to the thumping of mortar shells pounding the entire sound stage. The placement of effects to the left and right of the front stage are very accurate, while the planes providing air cover sweep from right front to right back very effectively. One has to be impressed as well with the use of the surrounds for ambient sound and full musical sound stage, but one must remember to duck and roll when the bullets are flying by your head. The dialogue is mostly front and center and understandable. Extras Review: This is the shame of the disc, and I hope a special edition is streeted later becuase this film deserves such treatment. The disc includes few extras, which is a shame for a movie that although jilted, was nominated for 7 Academy Awards® including best picture. What it does include are non-animated interactive menus, scene selection (31 cues), English and Spanish subtitles and captions for the hearing impaired, and eleven Melanesian choir songs. Due to the content, this is obviously not a film for the young or squeamish, and it seems easy enough to understand why some may dislike this film, as its high art may seem inaccessible. But this is a film not understood easily, or fully grasped without repeat viewing (and best done with captions on). This is however, a fine work unlike you would expect from Hollywood, and a welcome edition into those films that deal with the psychological as well as physical aspects of warfare. Although it may lack any real extra features, if this is a movie you were crossing your fingers over you need not worry it is a feast for the senses.